Gulf Construction Online - $19m evolution! Shangri-La Hotel, Dubai’s Lobby area ... a $19-milion renovation project. 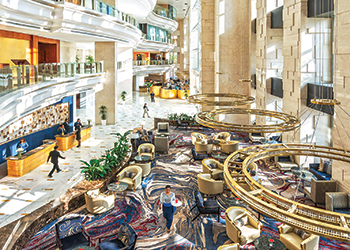 The completed Phase One renovation of Shangri-La Hotel, Dubai mixes modern Arabia with the hotel’s legendary hospitality. Shangri-La Hotel, Dubai has announced the completion of Phase One of its extensive renovation programme undertaken across its public areas including the Lobby Lounge and Dunes Café. The Dh70-million ($19 million) renovation programme marks a new chapter in the evolution of the hotel. Steel and gold chandeliers are suspended from the lobby ceilings, while a welcoming and open guest arrival lounge provides a warm and uplifting first impression for guests. A stunning ‘wave’ chandelier designed by bespoke chandelier designers, Lasvit, hangs in the entrance of the hotel. Another spectacular chandelier hangs in the two-storey staircase connecting the lobby and dining outlets. In the lobby itself, plentiful flashes of gold and ruby red detailing reflect the jewels of traditional Arabian suqs. 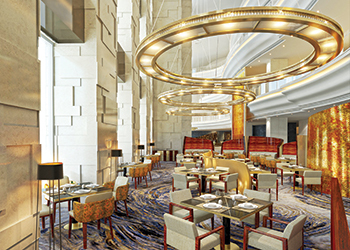 Shangri-La Hotel, Dubai’s Dunes Cafe ... a $19-milion renovation project. In addition, 4,212 hand-cut, blue, tiger’s eye stone tiles have been pieced together to form the entry walls to the six lobby elevators. The stone is also featured on the tables in the Lobby Lounge. Tiger’s Eye is a semi-precious stone believed to hold soothing qualities and has been introduced to bring a further sense of calm to the surroundings. The hotel’s impressive, atrium-style lobby area has been designed by Hirsch Bedner Associates (HBA), a leading hospitality interior design firm. The new layout across the renovated areas of the hotel has been planned in a manner which enables guests to effortlessly mix work with pleasure. Located on the ground floor, Dunes Café is convenient and perfectly placed for casual dining with friends or business associates. The live open kitchen, featuring numerous culinary styles, is a showcase for the best of international cuisine. The renovation project began in June 2016. Phase Two includes the renovation of 302 rooms and suites to be completed in 2018. Shangri-La Hotel, Dubai’s Dunes Cafe and Lobby area (left) ... a $19-milion renovation project.